AN/PVS-5 Night Vision Goggles are a self-contained, passive, image intensifying, night vision viewing system worn on the head with or without the standard battle helmet or aviator helmet. They are a second generation binocular system capable of providing night vision viewing using available light from the night sky (starlight, moonlight). The built-in infrared light source provides added illumination for close-up work such as map reading. The PVS-5 is equipped with a headstrap to allow "hands-free" operation. Shipping case, soft carrying case, eyepiece and objective lens cap, and arctic adapter assembly are authorized ancillary items. Demist shields are also provided to prevent fogging of the eyepiece. 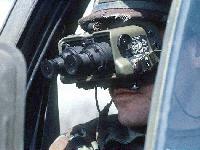 The AN/PVS-5 individual night vision goggles (NVG) were procured in the early 1980s. A general purpose goggle, they are found in a variety of applications, such as for vehicle drivers, riflemen, and unit leaders. There are differences in each model that require separate model support packages. The bulk of the Marine Corps assets are AN/PVS-5As, although all three models are distributed in the Fleet Marine Force.